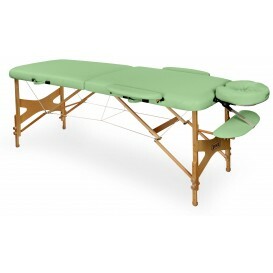 VIVA is a massage table, with rounded shape of the table top. VIVA has a construction made of beech wood. Under the table top, additional accessories / headrest, armrests, arm shelf /, are placed and supported by elastic straps which facilitates their transport when a table is folded. VIVA is a massage table, with rounded shape of the table top. VIVA has a construction made of beech wood. Under the table top, additional accessories / headrest, armrests, arm shelf /, are placed and supported by elastic straps which facilitates their transport when a table is folded.The table legs are connected by a system of steel cables that allow a quick set up of the table and improve its stability. Height is adjusted with easy-to-use knobs placed on each leg of the table. The table top is covered with high-quality upholstery, available in a wide range of colors. Price of the table does not include additional accessories visible in the picture.